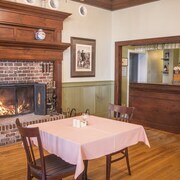 I had a great stay; the staff was very accommodating and the room was comfortable. Where to find Stellarton hotels near an airport? 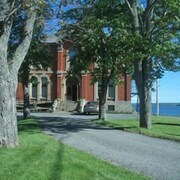 Where can I find hotels in Stellarton that are near tourist attractions? 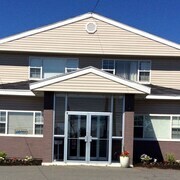 Searching for an apartment or hotel within a short driving distance of central Stellarton? Within a 0.1-kilometre (0.06-mile) radius of central Stellarton you'll discover 4 Expedia-recommended long-stay and short-stay accommodation options from which to choose. Hotels in easy walking distance of the Stellarton city center, are the Holiday Inn Express Stellarton and Comfort Inn New Glasgow. 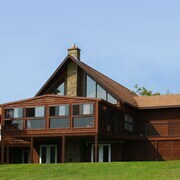 You could try the Pictou Lodge Beachfront Resort or the Dolan's Inn & Suites. The Pictou Lodge Beachfront Resort is positioned 17 kilometres (11 miles) away from downtown Stellarton. The Dolan's Inn & Suites, is 14 kilometres (9 miles) away. 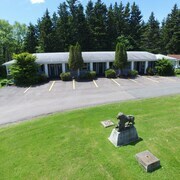 The Travelodge Suites New Glasgow and also the Braeside Country Inn are two alternative places to book accommodation around Stellarton. Looking for more things to do? Consider spending some time enjoying Antigonish Golf and Country Club and Antigonish Mall, which you'll find in Antigonish, 55 kilometres (34 miles) to the east of Stellarton. If you'd like to stay in Antigonish, check Expedia's booking pages for the latest deals at the Maritime Inn Antigonish and Micro Boutique Living - Antigonish. 50 kilometres (32 miles) to the southwest of Stellarton, you'll find Truro, which is home to the Holiday Inn Truro and Best Western Glengarry Hotel. The Truro Golf Club and Victoria Park are some of the most popular attractions to check out when visiting Truro. Get your sporting fix with a journey to Antigonish Arena, which is 55 kilometres (33 miles) to the east of Stellarton. 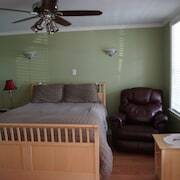 If you are interested in booking a bed nearby, make a reservation in the Homeward Inns of Canada or Antigonish Towne Cottage. Situated 90 kilometres (55 miles) away from Stellarton is Charlottetown Airport. Stay nearby at Holiday Inn Express Suites or Rodd Royalty. What are the most popular Stellarton hotels? Are there hotels in other cities near Stellarton? What other types of accommodations are available in Stellarton? Explore Stellarton with Expedia.ca’s Travel Guides to find the best flights, cars, holiday packages and more!